William Sauder is a leader in the forest industry and in education and health, and has played a significant role in the social and economic development of this province. For more than 25 years as chairman and CEO of International Forest Products Ltd., he directed the company’s growth into one of Western Canada’s larger and successful logging and saw-milling operations. He is now chair of Sauder Industries Ltd., a world leader in innovation and marketing. Mr. Sauder’s business acumen led to his membership on the Board of Directors of the Toronto Dominion Bank, the British Columbia Development Corporation and the Executive Committee of the Board of Directors of BC Hydro. He was also a member of the Board of Directors of the World Presidents’ Organization. Success in business has gone hand-in-hand with outstanding service to the community, and Bill Sauder is a highly respected figure in the world of philanthropy and medical research. 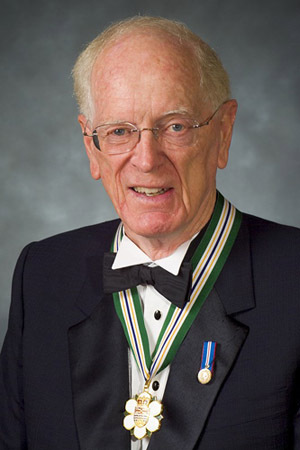 He served on the Board of Directors of the Heart and Stroke Foundation of B.C. and the Yukon and has supported numerous important medical initiatives at UBC. Thanks to the generosity of Mr. Sauder and his family, UBC now has the Sauder family Chair in Pediatric Infectious Diseases, the Sauder Family Chair in Viral Diseases of Children, the Sauder Family and Heart and Stroke Foundation Professorship in Clinical Stroke Research, and the Sauder Family and Heart and Stroke Foundation Chair in Cardiology. Last year he made it possible for the UBC Faculty of Commerce to establish a business school. A UBC graduate, Mr. Sauder has served the university for 12 years, including two terms as its chancellor. He received an Honorary Doctor of Laws Degree from UBC in 1990. UBC renamed the Faculty of Commerce to the Sauder School of Business after a major donation from the Sauder family.